IVERSON AVENUE – Just weeks after rebuffing a proposed goat dairy on neighboring property on grounds that it would harm the neighborhood, the residents of Iverson Avenue awoke last Wednesday morning to find that industrial agriculture of another form had brought unexpected fuss and bother to the ’hood. 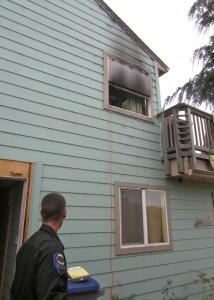 At about 4:30 a.m., a structure fire was reported at 1748 Iverson Avenue, a house owned by Grant Kimbell of Arcata. Arcata Fire personnel arrived within four minutes to find the two residents, Sonja Marie Bush, 28, and Darren Joseph Weeth, 34, standing outside with their two dogs. All were unharmed. According to Fire Chief John McFarland, Weeth was covered in black soot from an unsuccessful attempt to extinguish the fire. He refused medical treatment. Firefighters quickly located the source of the blaze in a hidden warren of rooms upstairs, and put it out. The fire had broken out in one of eight rooms in the house that were dedicated to cannabis cultivation and processing. The grow rooms were concealed behind a built-in bookcase in a bedroom suite. “The bookcase magically moved on a track to a reveal a three-room grow,” McFarland said. “It was nicely built as a grow room, and well designed.” The upstairs grow rooms were windowless, and the smoke eventually billowed from a window in an upstairs back room. McFarland said a grow light and box fan which had been suspended from the ceiling “both ended up on the floor, burning.” Weeth told firefighters he had been awakened by a smoke alarm. 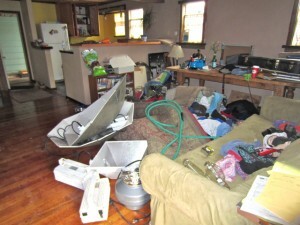 With the fire put out and electricity disconnected, police were notified of the large-scale cannabis grow, the residence was secured and a search warrant obtained. Come daylight, officers returned and discovered a “sophisticated” indoor marijuana cultivation operation inside the home and in a detached garage. 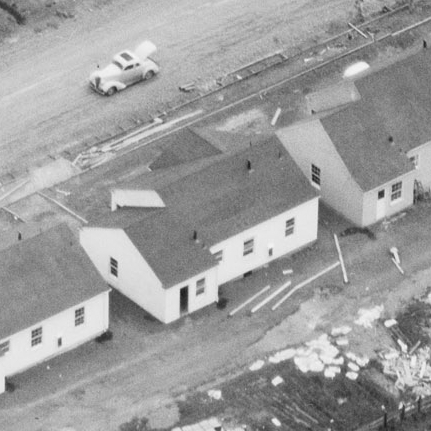 A second unit attached to the house was used for processing. Some 21 grow lights were seized, with the total wattage far in excess of the 1,200 watts allowed under Arcata’s Prop 215 guidelines. Bush and Weeth were arrested and booked into the Humboldt County Correctional Facility on felony charges of cultivation of marijuana and cultivation of marijuana for sales. They were released the next day, and were seen removing personal property from the darkened house. The firearms, a shotgun, hunting rifle and 9mm pistol, were all legal. However, it is illegal to possess firearms in the context of illegal drug activity, and Police Chief Tom Chapman said it will be up to the District Attorney’s Office to decide whether to add weapons charges. Property owner Grant Kimbell, who once maintained an office in Jacoby’s Storehouse as a property manager and handyman, was contacted out of town and notified of the blaze. He did not return a phone message. McFarland said the house had been remodeled in 2007, with the grow rooms likely installed at that time. “I’m sure that this is not a surprise to anyone involved,” McFarland said of the secret rooms. Chapman said the electrical service for the cannabis grow was relatively professional, compared to the usual slapdash rigs APD finds at grow houses. But it was nonetheless unpermitted and dangerous. 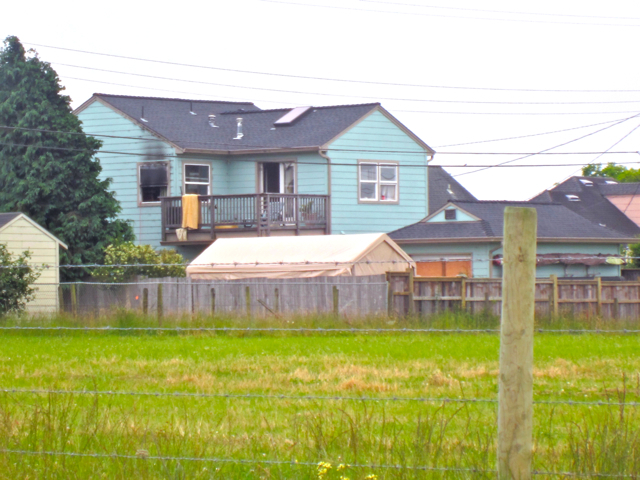 The City has issued Kimbell a Notice of Nuisance listing multiple violations of the Uniform Housing Code, California Electrical Code, California Mechanical Code, California Building Code and Arcata Municipal Code. Building Official Dean Renfer said that in addition to code violations involving the electrical system, the hidden rooms may have structurally compromised the home. He is concerned that the extensive modifications may be placing an excessive load on a joist. Kimbell must have a licensed electrical contractor make an inspection and list violations. In this case, inspection by a structural engineer is also being required. 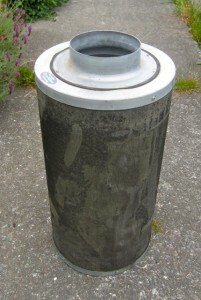 An illegal ventilation system installed to service the cannabis crop will have to be removed, and a tent canopy in the backyard must be removed. All the violations will have to be corrected before the nuisance designation is lifted. Even more repair work will be required because of water damage during the fire response. 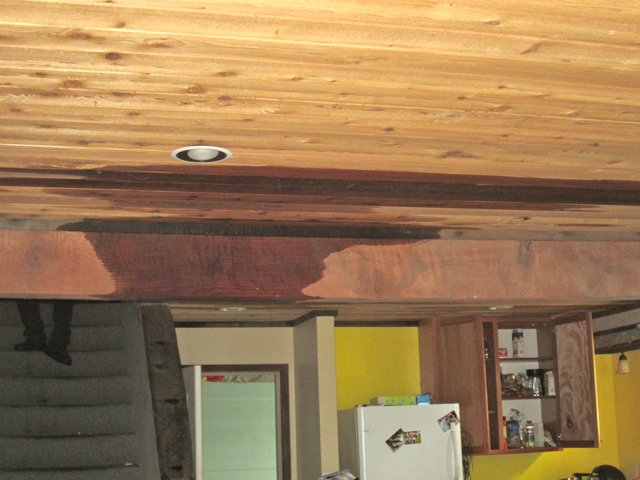 Water could be seen through the home’s open door seeping through the living room ceiling and staining a beam. 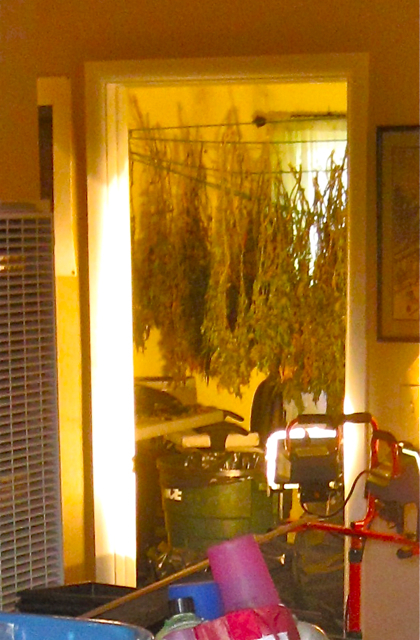 The residents were apparently living in and around areas of the home dedicated to cannabis growing. 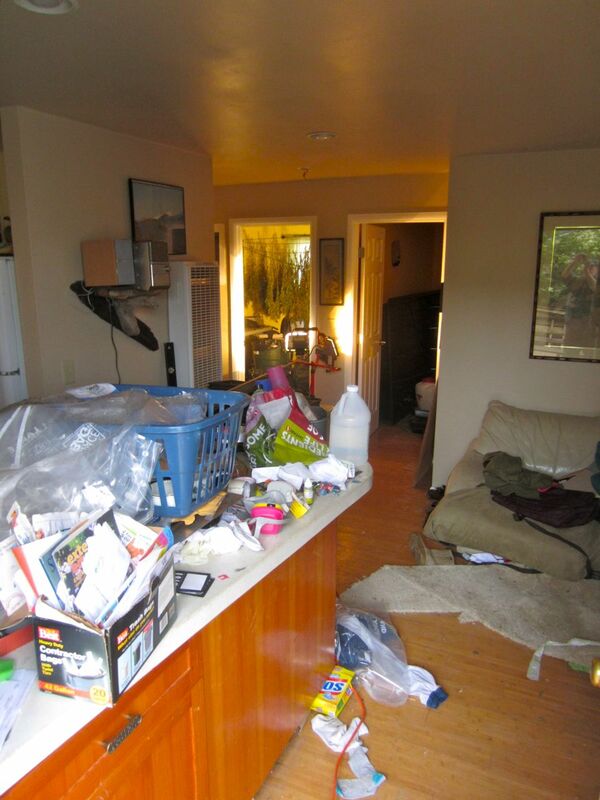 As with many grow houses, housekeeping appeared not to be a priority, with trash and debris strewn around on the floor and grow-related items stacked up on counters. If you suspect illegal drug activity in your neighborhood, contact the Arcata Police Department at (707)-822-2428. This entry was posted on Tuesday, August 2nd, 2011 at 10:57 am	and is filed under News, Environment. You can follow any responses to this entry through the RSS 2.0 feed.